Buoyed by dissatisfaction with the major political parties & the fact the Lib-Dems are no longer seen as the natural home of the protest vote the Greens are placing themselves as a serious political party rather than just another pressure group. Their problem is their policies & the way they choose them haven’t kept up. They also have a nasty habit of being rather authoritarian & don’t seem to like listening to advice – unless it’s from people they want to hear. Personally, when I lived in London I would often vote Green, especially in the Mayoral elections where they normally got my secondary vote. Like many people I liked the idea of the Greens but what I’ve seen & heard these past few years has changed my opinion. The Greens have made a mess of running Brighton & their pronouncements on rail transport (and Hs2 in particular) have combined hand-wringing, daft ideas & very dodgy assumptions. Now we’ve seen their leader, Natalie Bennett implode in an interview with LBC radio’s Nick Ferrari. This has led me to cast a critical eye over their policies relating to rail transport. What I’ve found is less than impressive. In parts, it’s downright dishonest. You see, the Greens have become obsessed with who owns the railways rather than understanding how they operate. They seem to have fallen for the populist rather than the pragmatic. They’ve ditched the chance to genuinely do things that will help the environment in favour of tub-thumping to gain votes. Ironically, they seem to have more in common with UKIP than they’d care to admit. Neither has managed to come out with a manifesto – despite the fact we’re only 7 weeks from a general election. And, like UKIP, they seem to think that opposing Hs2 will buy them votes (despite the fact they say they support building High Speed rail!). As we can’t cast a critical eye over the manifesto we’re left with their policy statements which they’ve displayed on their website. The one for Transport dates from 2009. It was amended in 2014 and again in 2017, more than two years after I wrote this critique. Now, there is some good stuff in there but what amazed me is how nothing is costed.It’s one huge statement of intent, a shopping list – with no idea how much any of it will be paid for other than a few glib phrases about ‘the polluter pays’, then mention of road charging & fuel taxes. It’s probably no wonder. Can you imagine spelling out detailed costs to the electorate & then expect them to vote for you? The Greens answer to everything seems to be ‘well, we’ll stick a tax on it’. What a complete and utter load of ideological tosh – and also plain wrong! Note that I wrote this critique way back in March 2015. That totally false statement is still on the Green Party’s website now (April 2018). First, let’s look at safety. The experts are the Rail Standards & Safety Board (RSSB) who monitor rail safety & collate the statistics in their annual reports. Here’s their 2014 report. Hear that? Its lowest ever level. There’s more. “There were no passenger train derailments. This is the first year with no such derailments since recording began more than 20 years ago”. In fact, the truth is that rail safety has been steadily improving for decades & that improvement has continued under privatisation. The Greens are not telling the truth about rail safety. Now let’s take a look at punctuality. This is more complex due to the fact the way performance is measured has changed over the years. Before privatisation it wasn’t really monitored. BR used to publish a performance figure in their annual report but how it was calculated is a mystery, it certainly wasn’t transparent. The figure never got above 90%. Privatisation brought in a standard method of calculating punctuality called the Public Performance Measure (PPM) it’s monitored independently & published openly. There’s no doubt that there was a major setback after that Hatfield crash in 2000. Yet this led to the demise of Railtrack & the establishment of Network Rail, which turned the situation around & punctuality rose even higher. Since privatisation, there’s been a huge increase in the numbers of trains run every year & we’ve seen a massive increase in the numbers of passengers being carried. Today, punctuality is far better than under BR but it is starting to fall back as our old network is put under increasing pressure. We’ll come back to this point later, but yet again the Greens have been shown to be deceiving people with their claims. Their attitude to privatisation appears to have nothing to do with the reality on the ground & everything to do with grandstanding in the hope of gaining some votes. Well, that’s nice! But what do those fine principles mean in practice? Opposing building a new North-South high speed line, that’s what! The utterly bizarre thing about this position is that it contradicts many of their other high-sounding ideals about extending rail use, getting more freight on rail, reducing air travel – and protecting the environment (amongst others). 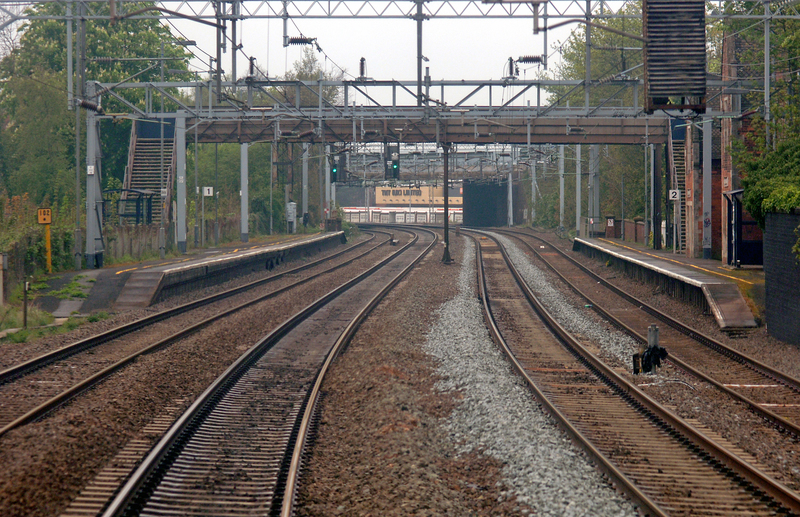 Hs2 is designed to relieve the pressure on the UK’s major rail artery, the West Coast Main Line (WCML) which is the busiest mixed use railway in Europe. The line is already running drastically short of spare capacity at the Southern end between Rugby & London but it will be full by 2024 at the latest. That means we need to be need to do something now. That something is phase 1 of Hs2 which is planned to be open by 2026. Incredibly, the Greens oppose building Hs2. The effect of not building is will be rail gridlock on the WCML, followed shortly after by the East Coast Main Line (ECML). Allowing this to happen defies logic & commonsense. It’s anything but ‘green’, yet this is what the Greens want to do. The Greens ridiculous situation of facing both ways at the same time came about due to a vote at their 2011 conference. Yes, rather like the old Labour party, conference decides what Green party policy is. Labour were sensible enough to ditch this as it led to such things as the infamous ‘longest suicide note in history’ (Labour’s 1983 manifesto). How he can justify this when the specifications of the new Hs2 trains hasn’t been decided on is a mystery. It’s also a remarkably simplistic soundbite as the reality is these are quite complex calculations which contain a host of variables. To reduce it to such a simplistic level renders it meaningless. For example, comparisons between different trains are most usefully made in terms of the average energy used per seat-kilometre (i.e. total energy used per kilometre for the whole train divided by the total number of seats). Where does Prof Whitelegg make this comparison? He doesn’t. It would be impossible. The new Hs2 trains haven’t even been designed yet! Really? Shouldn’t we first define which intercity train? After all, there’s more than one, diesel & electric! Again, this is a complex set of calculations simplified to the point of meaningless. It ignores the fact train design is continually evolving & that high speed trains are getting faster – yet use less energy. It also ignores the fact that emissions are only part of the story. Clearly, what Prof Whitelegg was doing here was pandering to some good old class prejudices (including his own, he was a long-standing member of the Labour party before joining the Greens). Does anyone seriously think any Government of any political colour would spend £42.7bn building a high speed, high capacity railway between our major cities, then price everybody but the ‘rich’ off it? Hs2’s 18 trains per hour will provide 26,000 extra passenger seats per hour, it’s essentially a high speed, long distance metro service. It would be economic & logistical folly to price it only for the ‘rich’ but this is the nonsense that Prof Whitelegg has sold to the Greens, based on an out of context quote taken from the HS2 business case! So, it seems that, based on hearing only one side of the story – and a story simplified & prejudiced as to be almost worthless, the Greens voted to reject High Speed 2. “Capacity problems on the West Coast Main Line can be solved by more trains, longer trains, passing loops and intelligent city regional planning. Going for extra capacity with a new high speed line ignores the impressive development of sophisticated teleconferencing, videoconferences and on-the-move IT solutions. The demand for rail transport is not an immutable physical law and can be reduced by promoting IT solutions. High speed rail is not a ‘get out of jail’ free card for carbon emissions and climate change. The proposed HS2 trains would burn 50% more energy mile-for-mile than the Eurostar and HS2 would produce more than twice the emissions of an intercity train”. Isn’t it wonderful when, with a flourish of their pen, an academic can ‘solve’ problems like that, without being troubled by the reality on the ground? Let’s have a look at the reality Whitelegg has ignored. A problem with academics is they rarely seem to talk to people at the coal face. If Whitelegg had, he’d have heard a few pithy home truths about his claims about the WCML. More trains? The WCML is almost at capacity, especially the Southern section between Rugby & Euston. So where’s Whitelegg’s evidence that we can fit more trains on it? He offers none. How on earth he thinks the busiest mixed traffic main line in Europe can fit more & more trains on it for the next 20,50 or 100 years is beyond me. Longer trains? We’re already doing that. The problem that Whitelegg ignores is you can’t keep extending trains indefinitely. London Midland are already running the maximum length they can – 12 cars. To extend them any more would be horrendously expensive as it would require platforms to be extended. In many places there simply isn’t the physical space to do that as tunnels, bridges & junctions are in the way. Virgin trains have extended most of their Pendolino’s to 11 cars. You could maybe get away with extending them to 12 but they would only be able to be used on certain routes. A great example is Liverpool Lime St station. The approaches are in a very deep cutting under the city with limited space for the crossings that allow trains to use different platforms. Extend the platforms & you can’t fit in the tracks so you render much of the station unusable! It’s the same at Birmingham New St and several other locations. Of course, HS2 doesn’t just help take the pressure off the WCML, it does the same for the ECML. I’d love to take Prof Whitelegg to Kings Cross, stand him on the end of the platform looking towards the Gasworks Tunnels & ask him to explain to me how, exactly, he would extend platforms there! Here’s a picture to illustrate the problem. This is the view from the end of one of the platforms. There’s also another problem with longer trains. They eat up capacity. With shorter trains you can have more than one using a platform at the same time. Good examples of this are Manchester Piccadilly & Birmingham New St. Stick much longer trains in and you run out of space, so you either have to cut services or build more platforms. Anyone who knows New St station will know building new platforms would be an expensive nightmare. These run parallel all the way from Euston as far as Hanslope Junction, 56 miles out of Euston. The tracks are in two pairs, the gap between the two sets (known in railway parlance as the ’10 foot’) is closer than on many later railways. This led to difficulties when the route was modernised (at a cost of £9bn) as it wasn’t possible to safely close one pair of tracks & keep the other pair running – the whole line had to be closed. Also, much of the line is built on embankments or traverses deep cuttings (like the famous one at Tring). So, where is the space for Whitelegg’s loops. The simple answer is – there isn’t. Not without spending some very serious money & causing huge disruption. Also, let’s not forget this railway was built over 175 years ago & a lot of it passes through densely populated areas with no spare land either side of the tracks. You’d have to demolish a lot of homes to build loops. People with knowledge of rail operations could have told Whitelegg & the Green party these problems. What a pity they’ve never bothered to talk to them. But then that’s academia for you. In the real world you ignore the devil in the detail at your peril. Whitelegg’s airy dismissal of the need for Hs2 & belief we can just keep fitting more & more traffic on our existing Victorian network is nonsense that ignores practical reality. Even if possible, how much capacity would Whitelegg’s hair-brained ideas add to the WCML? He doesn’t say. In contrast, Hs2 will add 143% & massively cut journey times, which will encourage exactly the sort of modal shift the Greens want. Oh, one last thing. Let’s look at Whitelegg & the Greens claims that we don’t need Hs2 because of “sophisticated teleconferencing, videoconferences and on-the-move IT solutions” We’ve had these for many years now. 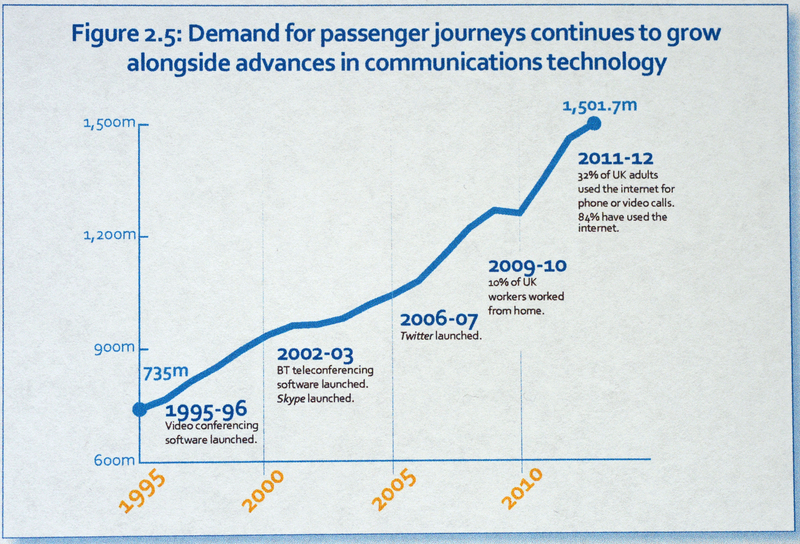 This little graph shows what impact they’ve had on rail passenger growth. None. At all. So much for IT removing the need for travel! 2017 UPDATE: The above chart only dates to 2011-12. Has the growth stopped? No. Here’s the latest chart from the Dept of Transport which tracks growth to 2016. You can find more 2016 data here. The irony of this confident assertion was that a year later the all party consensus on the need for Hs2 prevailed and the Hs2 Hybrid Bill was passed with 452 MPs voting for and only 41 against! The bill is now passing through the petitioning state & will receive Royal Assent in 2016. UPDATE. Royal Assent was actually granted in February 2017. So, where does all this leave the Greens? Well, with their green credentials shot to pieces really. Let’s be honest – Hs2 is the only game in town. 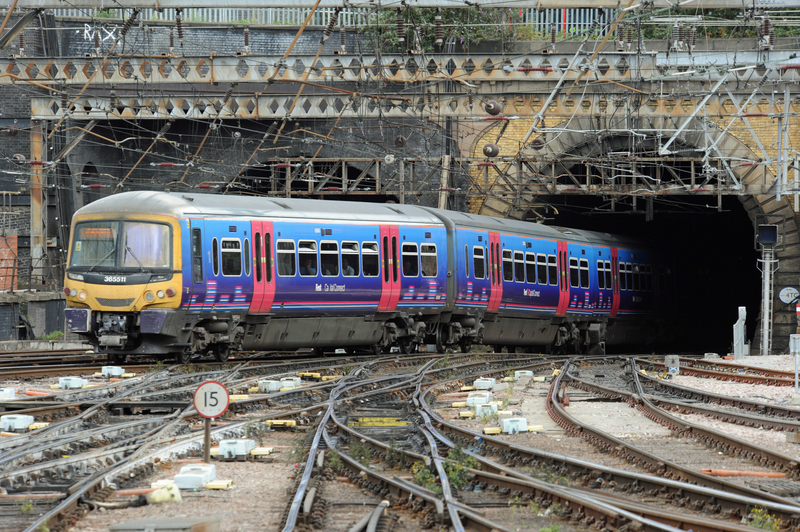 If we’re not going to end up with rail gridlock we need to be getting on with planning & building a new rail spine now. As it is, the first stage of Hs2 won’t be ready until 2026 & phase 2 won’t be open until possibly 2033. The Greens fine words on encouraging modal shift & getting people out of cars will remain just that – words. They have no credible alternatives to offer. They’ve failed to listen to the rail industry & a wider cross section of transport experts & fallen for the siren words of one of their own with an axe to grind. It’s left them with no credibility & no solutions to offer on transport. In fact, it will only make things worse. Without sufficient rail capacity for the future we’ll be even more reliant on road & air transport. Is that what they really want? At the moment none of the major parties has published an election manifesto, so it’s a bit odd to criticise the Greens for this. Also, you seem to have misunderstood what kind of policy document you are reading. The Policies for a Sustainable Society is a long-term list of policies that have been voted for by the Green Party membership at party conference over many years. If you want costed policies from the Greens, you will have to look at an election manifesto (which is, I’m told, currently in its fifth draft – which is expected to be the last draft before the finalised version). Also, it’s a bit rich to accuse the Green Party of “telling porkies” in an article where you assert that the whole of the West Coast Mainline is four tracks, because the part of that line I travel on most frequently (Coventry-Birmingham) is very definitely two tracks. I don’t assert that the ‘whole’ of the WCML is 4 tracks, but thanks for highlighting a typo. I said “the whole of the 82 miles of the WCML is essentially already four tracks”.What that should have said was “the whole of the FIRST 82 miles of the WCML is essentially already four tracks” I’ve revised it to remove any uncertainty & ambiguity. Paul I would like to take a moment to explain that the documents you may be referring to are the Green Party policy documents. These are not manifesto documents but guidance on what the Green party believes should be our position on a specific item. Some of these documents are over 30 years old now. The democratic process is that amendments must be proposed 6 months prior to either Spring or Autumn conference so as the membership can scrutinise and agree a policy proposal in an open and democratic way. The Green party is a very open party all our policies, core values and philosophical basis documents are in the public domain. Our 2015 manifesto is expected out on 22/03/2015. This is due to incorporating changes from our Spring Conference two weeks ago. As someone who has spent 17 years in the Railway Industry and 4 years in the Green Party it has taken time to get to grips with the process. The interesting point is that any member can propose policy, together with a seconder at draft stage. Proposer plus four for the conference proposal. The agreed policy voted at Conference is binding upon the leadership. You are welcome to join us and help make our policies better. Hello Brian, sorry for the delay in replying. he way the Greens choose policy is why they end up in a mess. It’s a beauty contest of the sort Labour threw out years ago. Why? because it leads to bad policies. It’s all very well to claim it’s democratic, but there’s no intellectual rigour or analysis – hence your mess over Hs2. If you’re going to come up with sensible, pragmatic policies they need to be debated at a higher level between people who know the real issues & who can advise on them. Clearly, that hasn’t happened on your rail policies, otherwise you wouldn’t still be promoting the dishonest nonsense about how privatisation was a ‘disaster’ for rail safety & punctuality. It’s the same for Hs2, some of the stuff Whitelegg has conned you with would easily have been countered by someone who had real rail knowledge. But no-one was there to do it. If the Green party want to be taken seriously, you’re going to have to come up with a better way of making policy than this. Hello Paul, thanks for the reply. I agree with you in many ways but the policy process is within the constitution of the Party. I am looking towards Railway Industry people and supporters to get involved in updating the policy. This will need to be put before Spring Conference 2016 as the Autumn Conference deadline is too near to get a meaningful dialogue resolved. I am happy to take forward proposed policy changes from anyone who has genuine interest in the future success of the Railway Industry. The Health Policy was reviewed at last Conference and the policy runs to 14 pages. I can be contacted at brian.smith@greenpart.org.uk if anyone would like to put forward specific ideas or proposals. It’s refreshing to see that some of the grassroots Greens are willing to discuss this issue & the points I’ve raised in my blog. What a shame that the Greens leadership isn’t. Hopefully the Greens who are concerned about this can get together & start that dialogue towards 2106. Feel free to use my blog if you find it helpful. I’ll be blogging again soon on the obsession with renationalisng the railways & the false premise that doing this is either feasible or desirable.